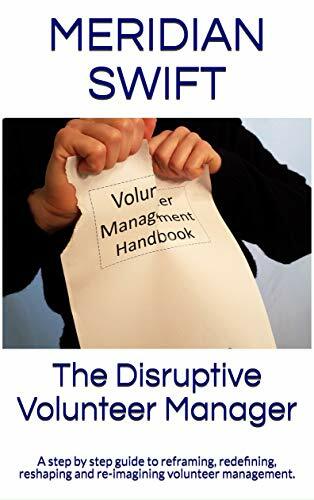 I’m really excited to announce my new book, “The Disruptive Volunteer Manager” will be available in a few days, both in paperback and in Kindle version. The power of volunteers and volunteer initiatives is amazing. From witnessing a single volunteer deeply connect with someone to seeing hundreds of volunteers come together for a noble purpose, it has been life altering. It’s as if volunteering is a living, breathing entity, one that appears each time common goodness unfolds. 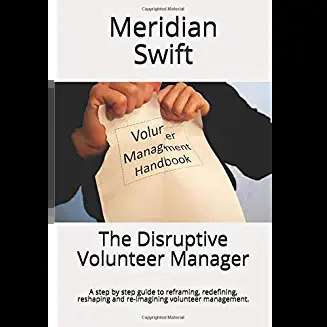 “The Disruptive Volunteer Manager,” lays out six steps to increase awareness of volunteers and to elevate volunteerism by disrupting the volunteer management norm in a forward moving way. It is a step by step journey to setting a new normal, one in which leaders of volunteers unleash the potential that awaits. What is volunteer role scalability? What is volunteer synergy and why is that so important? What is a volunteer block chain and what does this mean for volunteer management? I believe 2019 is the year that sets up the coming “Decade of Volunteerism.” Yep, I’m that hopeful sure. So much has changed in just the past few years and although change is difficult, the end result is going to be amazing. We can solve our frustrations and elevate volunteer value by proactive solutions. Get ready. Volunteer managers or wait, Leaders of Volunteers (LoVols) have arrived! Congrats, Meridian! You have such a “disruptive” perspective on volunteering – can’t wait to read your book. Thank you so much, we’re all in this together! The 2020’s belong to volunteers, leaders of volunteers and volunteer programs (initiatives)!